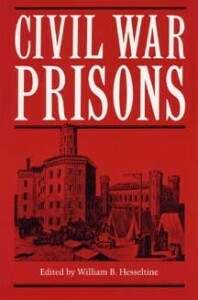 First published in 1962 as a special edition of Civil War History journal, Civil War Prisons remains the standard on the topic. Editor Hesseltine tackles the historiography of northern and southern prisons during the American Civil War. He attempts to bring closure to the legendary northern myth that the Southern government did its best to “exterminate” Union prisoners by calling the effective northern war propaganda a wartime “psychosis.” Furthermore, the author offers his analysis over the much debated prisoner exchange system, and comes down hard on the North, especially its government and General Ulysses S. Grant, for their questionable approach to this issue.